The village Cârta (Csíkkarcfalva in Hungarian) is at 23 km distance from the county town of Harghita (Miercurea Ciuc) at the foot of the Harghita Mountains with it’s hospitable Hungarian inhabitants. You are invited to spend your holidays only by yourself or with your family or friends in rural tourism form. For this reward at your disposal there are 18 rooms for 37 persons in total. It is a new building, built in modern style. 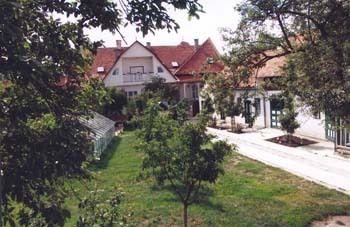 It has a large garden with fruit-trees and flowers. The rooms are simple with double bed. Every room has its own separate bathroom with shower. Provided with full board: breakfast, lunch, dinner. The owners organize a picnic-day, a trip to the wonderful Harghita Mountains together with the horses carriage, which includes the meal.